As the Introduction states, this is a distillation of the core of Chaosium’s Basic Role Playing system, the mechanic that has powered many of the company’s best-known games such as Call of Cthulhu and RuneQuest. While the full system fills many pages, it is simple enough for the core to be presented fully-playable here, as an introduction or for use with a setting other than the main game lines. The Introduction continues with an explanation of what role-playing games are all about, particularly useful if you’re using this work as an introduction to this type of game as well as to the BRP system. In describing what role-playing consists of, mention is made of the range of genres and settings you can play in… and this core system will enable you to play in any of them, with a suitable selection of character skills. 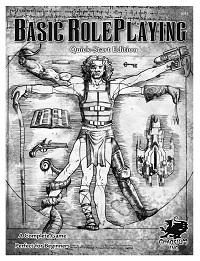 What you need to play, typical lengths of game sessions, dice and the role of the Game Master round out the chapter. Chapter 2: Characters looks at creating a character to play. The central parts remain the same, whatever setting you intend to play him in. Your character needs an identity (things like name and appearance), he’ll need basic characteristics (strength, dexterity and so on) and he will know a range of skills. Characteristics are rolled using 3d6, and various other things are derived from the raw scores. Skills are all measured as a percentage chance of success, and each one has a fairly low starting percentage that sometimes is based on one of the characteristics… and then as you decide what the character knows and can do at the outset of the game, you can increase the skills appropriate to his profession and background by spending points. Some equipment and an idea of what he’s doing wherever your game begins and he’s ready for play. Naturally, for a core set of rules, the range of professions and skills available are quite narrow. Other books provide more, based on the genre and setting involved, and it is always open for players and GMs to come up with their own. The chapter ends with some examples of character creation. Next, Chapter 3: System looks at how you actually use that character’s abilities in play to determine his chance of success or failure at, well, whatever it is he is trying to do. Die rolls are used when it matters – for your character or for the plot – what the outcome is, and when the task being undertaken is one that you may not be able to do with any guarantee of success – most characters can walk up the stairs or make a cup of tea without difficulty, but if you are fighting or defusing bombs or driving a chariot in the arena it’s a bit more chancy! The basic roll to succeed is a percentage under a relevant skill’s chance as written on the character sheet, but other factors such as the difficulty of the task and whether someone is opposing you will affect the number you need. You have a chance to improve any skills that have been used successfully at the end of the game session. Chapter 4: Time examines how time passes during the course of a game. Sometimes several days or weeks pass with just a couple of sentences, while upon occasion you need to know what is happening in detail, minute-by-minute – compare a sea voyage with a fight, for example. Different skills use a different amount of time for a single use, from a few seconds to spot something, to minutes to hold a conversation in a foreign language to hours or days spent doing research or painting a picture. Then comes Chapter 5: Combat. This may or may not be a focus of your game, but it’s inevitable in most adventures that at some point your character will have to use force to achieve his goals… or to defend himself against someone who wants to stop him at all costs. Naturally, this is one time you need to take the action step-by-step taking turns to ensure that everyone gets a chance to participate. Characters can wield weapons, dodge, move around and undertake other actions as appropriate. Taking damage and healing it are also covered. Next Chapter 6: Spot Rules looks at characters’ chances of noticing something – which may be a bit vital like someone sneaking up to attempt to bash your character over the head! Or a vital clue that will make your investigation so much easier. There’s also some examples of events in play, combat and otherwise, here. Chapter 7: Adventures presents some brief encounters that serve to demonstrate both the rules in action and the breadth of possibilities available in terms of genre, setting and style. Rescue a messenger and his vital message from the clutches of Cardinal Richeleau as group of Musketeers, trek across a wilderness planet in the far future, loot a golden idol from a jungle temple… or even rob a present-day bank! Each brief encounter (and there are several more as well as those mentioned) gives a situation, a map, sample characters and details of the opposition: plenty to try the system out. There are also a few additional monsters for good measure. This serves as an excellent introduction to this particular game mechanic, indeed to role-playing as a pastime, and lays the groundwork to enable you to decide just what sort of game you would like to play. It’s complete and playable as it stands, but if you choose to acquire further material, you will not have to ‘unlearn’ anything, this core quickstart is true to the full ruleset.